When you are ready to install this theme, you must first upload the theme files and then activate the theme itself. You first have to download the theme from your "Downloads" section on ThemeForest. Log into your account and download either the "All files & documentation" or only the "Installable WordPress file" package. FTP Upload: Using your FTP program, upload the non-zipped theme folder from within the "All files & documentation" download package into the /wpcontent/themes/ folder on your server. 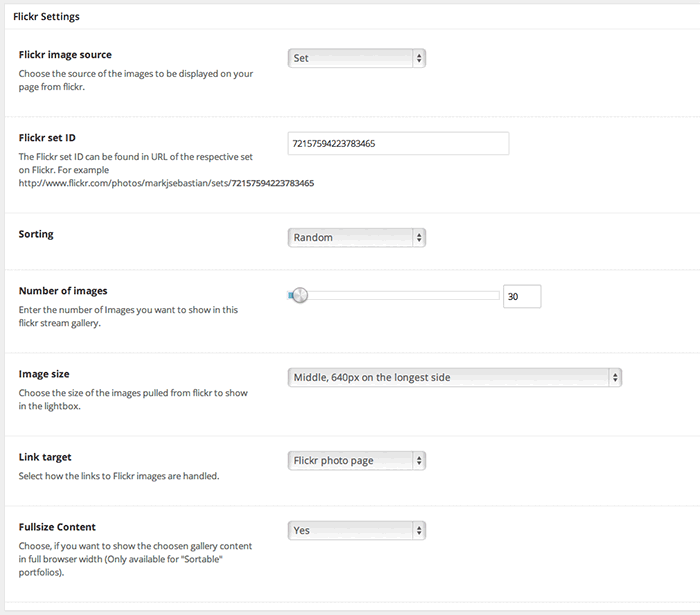 WordPress Upload: Navigate to Appearance > Add New Themes > Upload and go to browse. Select the zipped theme file from the "Installable WordPress file" download. Click on the Install Now button and the theme will be uploaded and installed. Unfortunately, you have installed your theme incorrectly, this is why your navigation menu does not work as expected. Do not use WordPress Zip-Uploader with the full package download. Only download the WordPress theme installation file from Themeforest if you want to use the WordPress theme installer. Please take a closer look to this video how to install your WordPress Theme in a correct way: My WordPress Theme isn't working, what should I do? As you can imagine, this is the important part of your theme. This is, why you bought it. So now lets go and add some photos and galleries with your greatest images. We will create those galleries with our custom post panel photos on the left site. First we need to create the Parent Page for our Galleries. We will need this page for our Navigation Menu later on. If you are using a clean WP Installation there is a auto generated page called "Sample Page" or "About" -> delete this page. Search for "Add New" under the Pages tab. Add a new page with the title "Photography" or "Portfolio" or whatever you want to call this page. At the beginning you can leave the content blank. Click on the Update/Publish button on the right top to save your page and make it visible on the front. 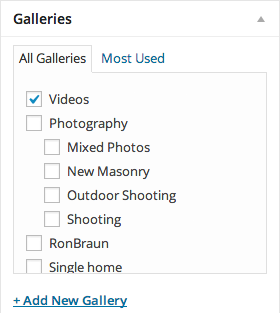 Search for the Photos tab in your Wordpress admin navigation and choose "Galleries". Add a gallery called Portfolio or Photography or whatever you like to name your parent gallery. Add more galleries like Shootings, People, Cities or Traveling with the gallery created before as Parent Gallery. Dont forget to add a description for your galleries. It will be shown on the page as well. Now we are ready to add some Photos to your created galleries. Enter your photo title, a text in your post editor text field to use as photo description and a small excerpt for your Photo. The excerpt will be displayed as image caption for your photo in your slider or gallery. If you do not set a excerpt, the caption on your photo is automatically hidden. If the "Excerpt" input field is not visible for your, you have to open the top rigth "Screen Options" tab and activate the checkbox for "Excerpt". The input field for "Excerpt" is then showing within your post edit area. Choose your Gallery on the right side. You should consider to setup and choose a parent gallery to ensure a clean sorting of your photos. You can also have only parent galleries with no sub-galleries and it will work just as. Now click on the link Set featured image on the right menu "Featured Image" and the WordPress media gallery will open up in a popup window. Upload your images or choose an image, that you have uploaded before. When the upload is complete or you want to choose an existing image, click on the image you want to use as your featured image and click on the "Set featured image" button at the bottom right. The media gallery is closed and the image is set as "Featured Image". You must save the post for the change to take effect. Add some tags on the right side at Post Tags to your photo post, which describes the shown image best. Now choose your photo settings for this photo. Perhaps you want to open the photo only in a lightbox, or you want to show a detailed page for this photo, where your description is visible and visitors can leave some comments? You can adjust this setting for each photo post individually. Lightbox The image of this photo post will handle the click to show the featured media in a lightbox. This can be an image or a YouTube or Vimeo video. There will be no link to the detailed photo page. Project Page Click will handle the link to got to the detailed photo page. External Link Click will redirect to an external link with a selected target (_blank etc). Self hosted video Click will handle the link, to go to the project detail page with the attached self hosted video. YouTube embedded video Click will handle the link, to go to the project detail page with the attached YouTube video. Vimeo embedded video Click will handle the link, to go to the project detail page with the attached Vimeo video. Disable Link With this option no link is set on an image thumbnail for this photo post. Maybe you want to add a background image to your new created photo post. 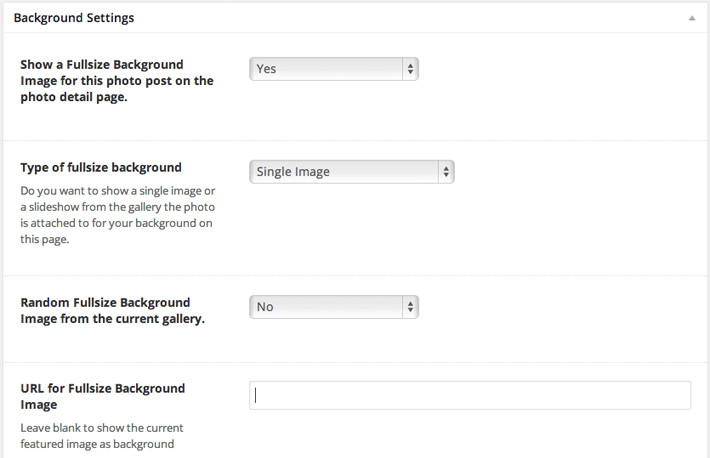 You can setup your background image easily with the "Background Settings" optionset. Choose "Yes", if you want to show a background image and setup the new options which are then displayed. Save/publish your new photo post when you have done all your settings-. Your photo post is now ready to show within your homepage full size slideshow. Goon and post some of your images like above.We will need more of them later for our full size gallery. You can also add videos to your photo post. Choose between showing the videos in a lightbox from YouTube or Vimeo or show them on the detail page (Self hosted, YouTube or Vimeo). 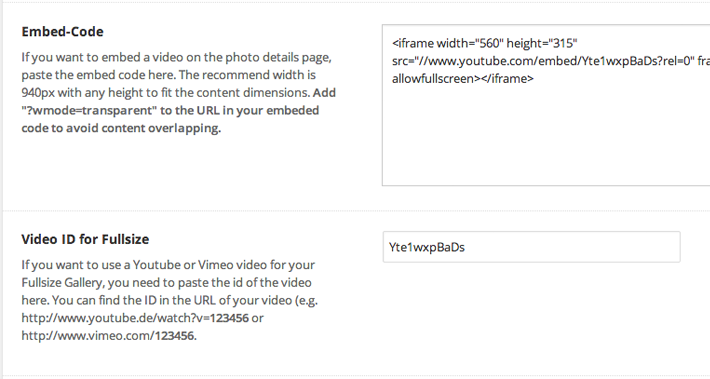 Your videos will also be shown in your full size galleries as background video. Those videos open in a lightbox, when you click on the featured image of this photo post in a gallery view. There will be no link to the photo detail page! 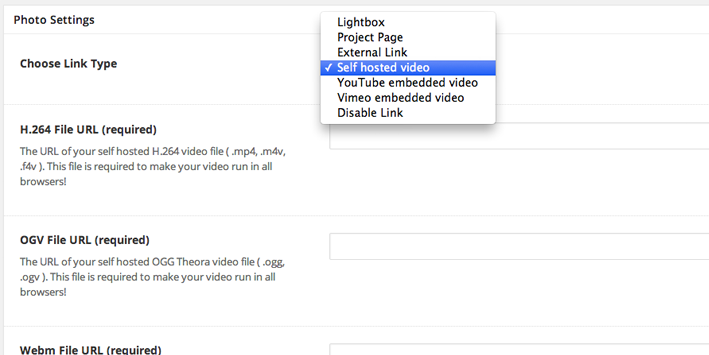 Choose YouTube-Video or Vimeo-Video from Type of media options. 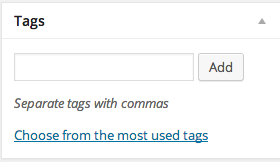 After you've made your settings and filled out all the options, save/publish your new post. If you want to add a video to your project page and show it on your detail page or even in the full size gallery, you have to change the Choose Link Type of your photo post to Self hosted video, YouTube embedded video or Vimeo embedded video. Post featured image The currently attached featured image will be shown as your video poster image. Image URL A custom image will be shown as your video poster image. You have to enter the URL in the field below. Set the Video Height. The width is default 660px content width. Set the other options like Stretching and Autoplay. After you've made your settings save/publish your new post. Enter the YouTube video ID in the field Video ID for Fullsize. This is important to show your video in a fullsize gallery. The YouTube video ID looks like this http://www.youtube.de/watch?v=123456 or http://www.youtube.com/e/123456. 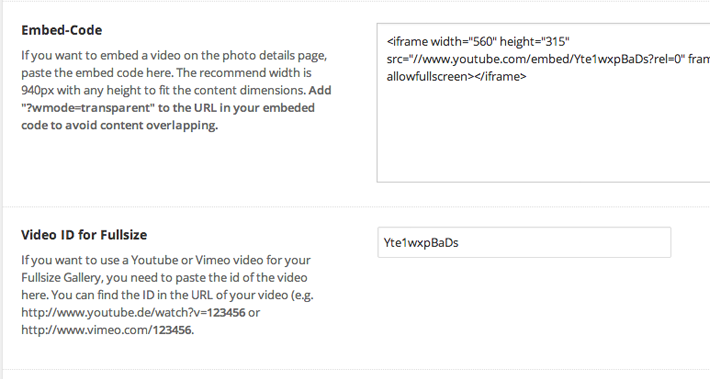 Enter the Vimeo video ID in the field Video ID for Fullsize. This is important to show your video in a fullsize gallery. The Vimeo video ID looks like this vimeo.com/13412780 or http://player.vimeo.com/video/13412780. Now that we have created several galleries and photos, we want to create a page to display them. Create a page for a gallery you want to add to your theme. Add a description in the post editor field and an excerpt for this page, which describes the gallery best. The excerpt is showing on top of the page as small summary of the page content. If the "Excerpt" input field is not visible for your, you have to open the top right "Screen Options" tab and activate the checkbox for "Excerpt". The input field for "Excerpt" is then showing within your post edit area. 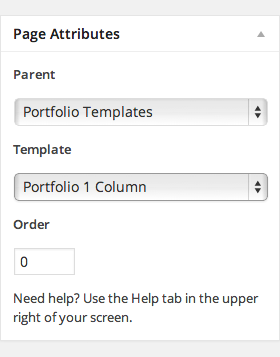 Go to the right panel and choose one of the "Portfolio Templates" as page template under the tab "Page Attributes". 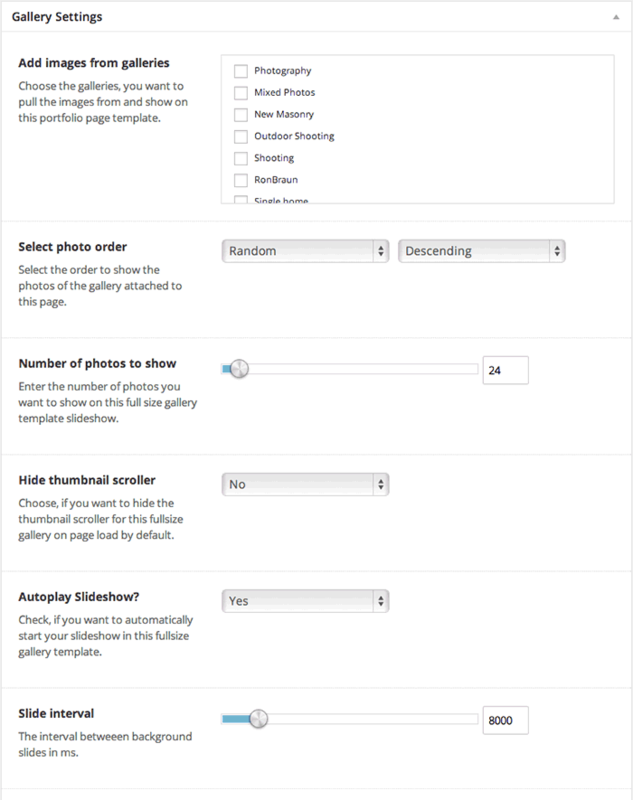 Perhabs you have noticed the "Gallery Options" settings below the post editor textarea on the left side. Within this option set you are going to control the look and the feel of this portfolio page. As you can see, there are actually no options available. You have to save your Page with a Portfolio Template before you can choose a Gallery. Save your Page now! Now if you take a look at our "Gallery Options" again, you can now choose your galleries to show in this portfolio page template. As you can see, there are also some other options as well. Change the options to your needs and follow the instructions on each option. The available options may vary for some portfolio templates. After setting up everything save your work! The selected galleries are now attached to the created page and are showing up on the page if you check the page on your website. Have you created a few photo posts? Great! Then we can now configure one of the main reasons you have bought the theme for - the awesome homepage full size gallery! Choose the Fullsize Gallery tab. Choose your galleries to show in the default homepage full size gallery. You can find many others options as well. Please set the options you want and check description beside each option for further information. Your full size gallery on your homepage is now ready. Play around with some options and setup the full size gallery as you like. There are many options to customize the full size gallery and give it your own look. 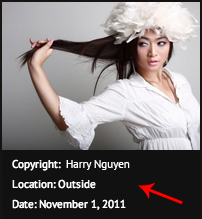 You can enable an add additional information to your photos like copyright, location and date. These settings are made on the photo post option page under the description box. But remember, you have to activate the additional informations for a specific gallery on the page template itself. Invictus brings you additional Information fields for your photos as mentioned above. Now to display this informations on a gallery page you have to activate them in the page template options. Go to Pages and choose the gallery page you want to edit. Now your additional informations are shown on the choosen gallery portfolio page. To link an image to an external page instead of linking to a lightbox or a project page your only have to choose "External Link" from your photo option page at "Photo Settings" and enter the URL of the external link. A Click on the image now referes to the entered URL in a new Window. Now we have to create our navigation menu. 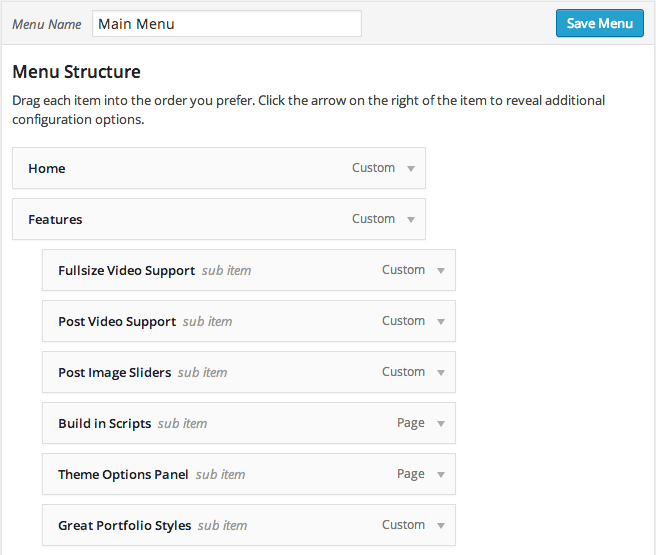 You can add several items to your menu, including pages, categories or even custom links. To extend the available widgets, click the screen options tab at the very top of the screen and configure your options. Search for "Menus" under the Appearance tab in the left admin navigation. Enter a name for your menu (e.g. "Top-Navigation") and click on the "Create Menu" button on the top right side and save your menu. After you have created your menu, click on "Manage Locations" at the top tabs and select the menu created before for "Primary Navigation". Cick on "Save changes". Now you have created your own menu for your page. But its still empty. Lets fill it. Go back to "Edit Menus" at the top tabs and search for the Pages panel on the left site and click on the View all tab. Select all pages you want to display in your Navigation and click on "Add to Menu". Your added menu links should appear on the right side like shown below. You can change the order of your pages by simple drag and drop the entries. Save your menu with the top right button "Save Menu". Save your menu with the top right button "Save Menu". You can now take a look on your frontpage. The menu works as expected. 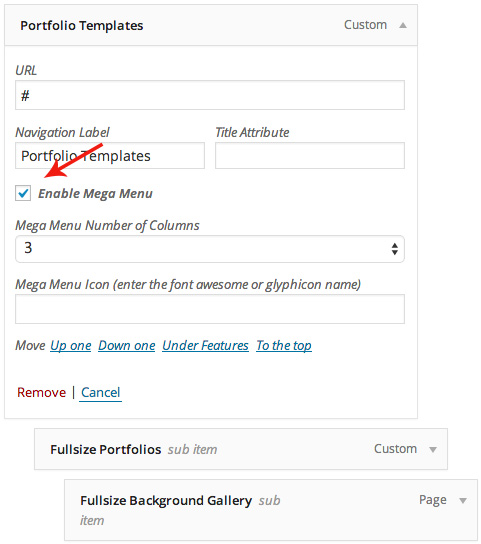 Before you can use Mega Menus in your theme, you have to activate it in your theme options. Go to your "Invictus" theme option panel and select the "Menu" tab on the left. Then search for the option "Enable Mega Menu" and switch it to "on". No search for "Menus" under the Appearance tab in the left admin navigation and choose the menu you want to add a Mega Menu to. After creating the structure of your Mega Menu open the main parent menu item and activate the check box for "Enable Mega Menu" and choose the number of columns or leave it on "Auto". To add an icon to a sub-menu element, you have to enter the FontAwesome of Glyphicon class name in the input field. Please grab the names from FontAwesome or Glyphicons. 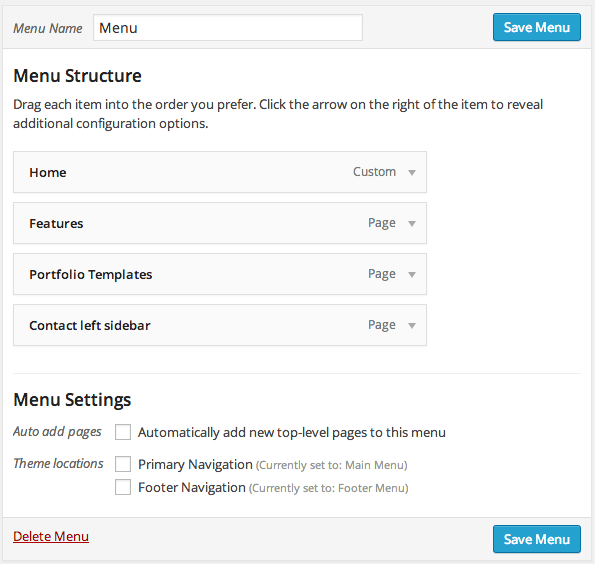 Save your menu and reload your theme page to show the Mega Menu for the respective pull-down. This theme comes with several custom made templates to present your work in a stylish and unique look. 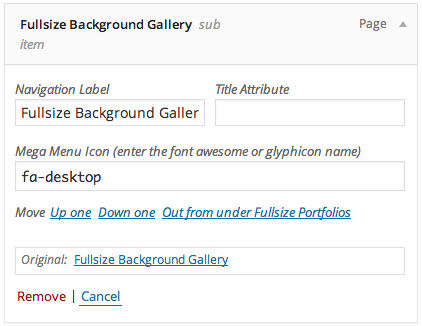 You can simple choose those templates when you create a gallery page. Please read the documentation 4.2. Creating the gallery page first. 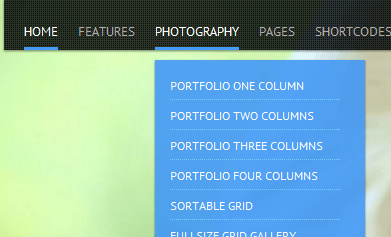 The column templates are designed to show your photos in a column grid view. Those templates do not have any additional settings expect the standard sorting and copyright settings. The Flickr Fullsize Template is designed to show your Flickr photos in a fullsize background stream. 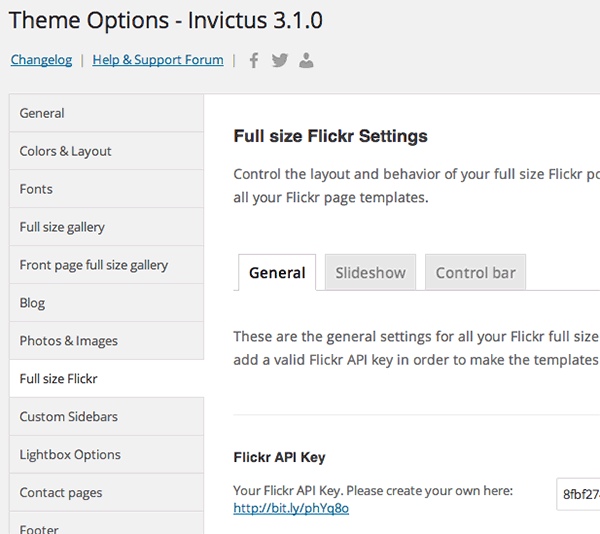 To make this template work, you need to get an API Key from Flickr and enter this key in your Invictus theme settings at the tab "Fullsize Flickr".Get your Flickr API code here. Add a new page with a the title of your gallery. Go to the right panel and choose the "Portfolio Flickr Fullsize Gallery" as page template under the tab "Page Attributes". The Flickr Fullsize Settings box should now appear in the middle. You can also change the Sorting, Total slides and Image size for this gallery. 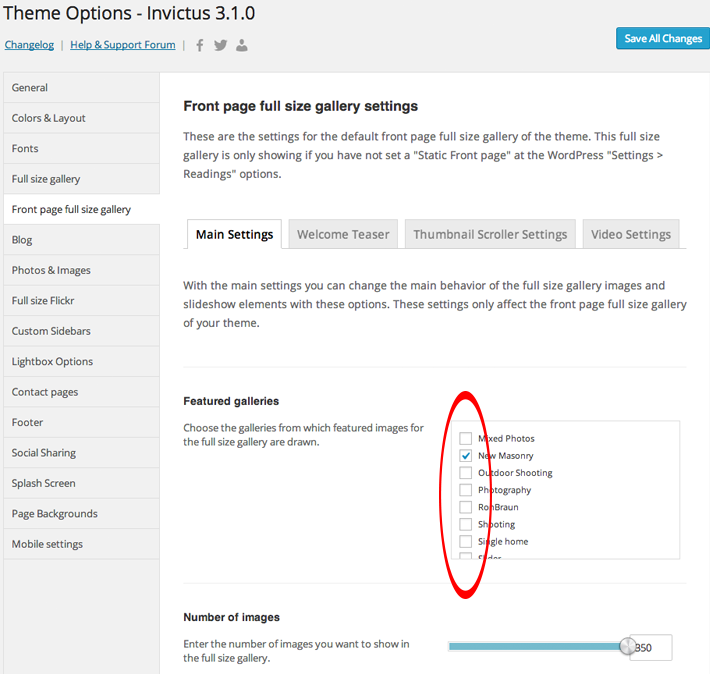 If you want to change other settings for the navigation elemenst, the slideshow or some other things you need to change these settings in your Invictus theme settings at the tab "Fullsize Flickr". The settings apply globally to all fullsize Flickr templates. 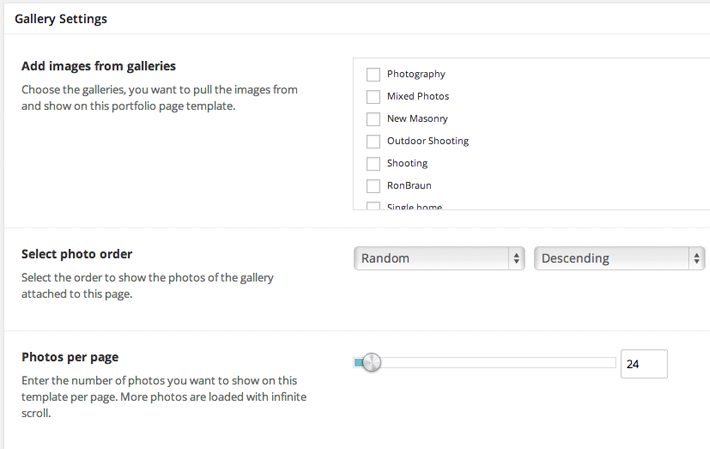 Save/Publish your new gallery page. This template is quite the same as the Portfolio Flickr Fullsize Gallery template with one difference, images are not shown in fullsize background mode but in a column layout. Go to the right panel and choose the "Portfolio Flickr Stream" as page template under the tab "Page Attributes". The Flickr Settings box should now appear in the middle. All settings are the same as the settings for Portfolio Flickr Fullsize Gallery. There is only one additional setting. 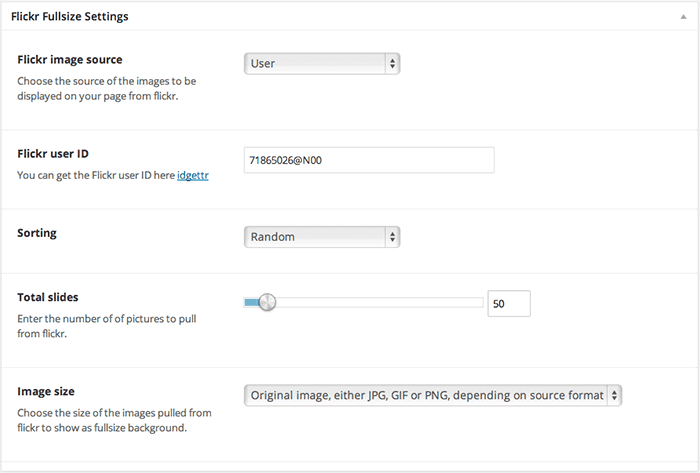 You can change the way images should handle the click, open your images in a Lightbox or link to the respective Flickr photo page. This template shows your previous created photo posts in a fullsize background gallery. Go to the right panel and choose the "Portfolio Fullsize Background Gallery" as page template under the tab "Page Attributes". The Gallery Settings box should now appear in the middle. Choose your Available Galleries to show in this template. Setup all other settings as you like. If you want to change global settings for this gallery type, you need to change these settings in your Invictus theme settings at the tab "Full size gallery". These settings affect all your full size galleries within the theme. You can create a single fullsize background video with this template. Go to the right panel and choose the "Portfolio Fullsize Background Video" as page template under the tab "Page Attributes". The Fullsize Video Settings box should now appear in the middle. Enter the M4V File URL and the OGV File URL of your video. You need to create a category and a Blog page to make the Blog on your Theme working. If you do not want to create a Blog for Website, skip this point and continue to the next one. We need a Blog Category for Wordpress to know, where your Posts are related to. Add a category called "Blog" as a main category without a parent category. Add a new page with the title "Blog" or whatever you want to call your blog. Its your choice. But "Blog" as title for now should meet the claims. 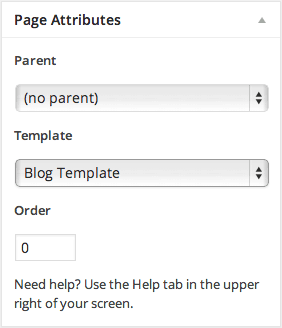 Go to the right panel and choose one of the blog templates as page template under the tab "Page Attributes". Without this setting, your blog page will not work correctly! Choose the previous created blog categories to show on this blog page at the "Blog Options" meta box. All posts from this choosen categories will be shown on this page. Allways have in mind that while you are publishing your Blog-Posts, you should select category for the Blog. Otherwise your Blog-Post is not shown in your Blog. Adding a Blog post is nearly the same, as posting an image. The only thing is, that we do this at another place. If you have a clean installations of wordpress, there is a autogenerated post called "Hello World". Delete this one. Enter your title, description and a small excerpt for your Blog post. 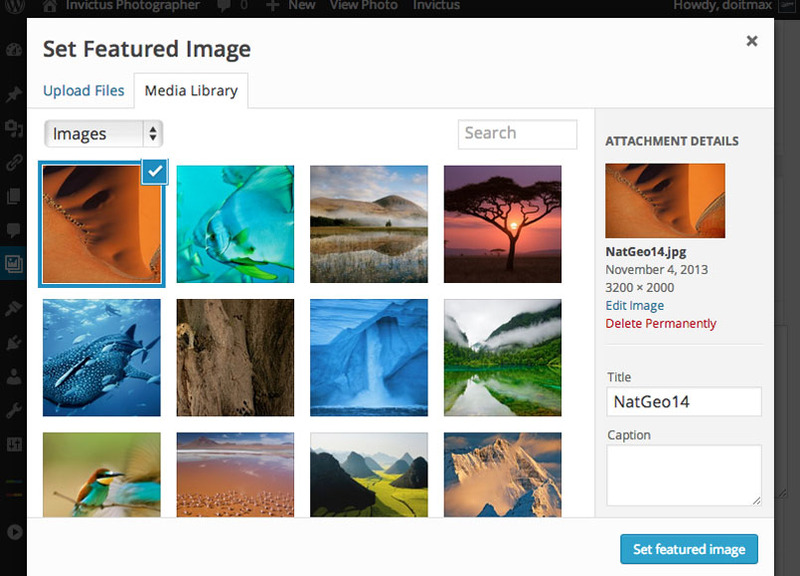 Choose the Blog Category and add a Featured Image like we did before at "Adding Photos to your Gallery". Your blog post will be displayed in the blog category on your page. Invictus brings you a "Ready to use" contact page Template. You only have to create the Page with the Contact Template and setup some Options. Add a new page with the title "Contact us". 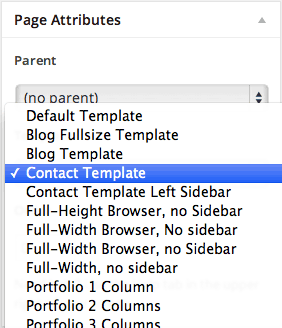 Go to the right panel and choose the "Contact Template" as page template under the tab "Page Attributes". Without this setting, your Contact page will not work correctly! Add some text to your page, if you want. It will be displayed over the contact form and will have no influence to the form. 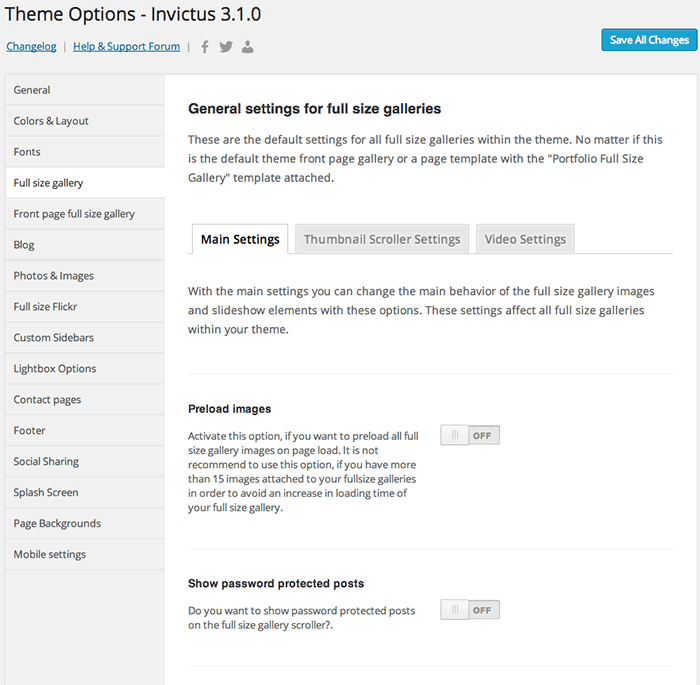 Go to the Options Panel of your Invictus Settings Menu in the left Wordpress navigation. Look for the Contact Us tab and enter your email-adress in the "Contact form email" field. This is the email adress, where contact request will be send to. Fill out all other Information you need. If you leave one Information blank, it will not be displayed on your Contact Page. After that, your Contact Form is ready to use. You can choose between two different Color Schemes, Black and White. Go to Invictus Settings Menu, click on the Colors tab. Choose the "White Theme" or "Black Theme". Thats it, your Theme is now available in the choosen color. Search for the option Custom Logo. Search for the option Use custom login logo. Switch the option to "On"
Create your own logo with the dimensions 326x67px, name it wp-login-logo.png and upload the new logo to the folder "/invictus/images/". Overwrite the existing file. Thats it, your done. Your Invictus Theme has now your brand. You can control nearly every color of your Invictus Theme. Everything is changed on your Invictus Theme Options Panel. Add the colors of your choice to the Main Elements like Pulldowns, Borders etc. Now your theme is in the colors you choose. You can set up your social icons on the footer easily. Go to Invictus Settings Menu, click on the "Social Management" tab. Choose the social networks you want to display. Enter the URL of the choosen networks and save your work. 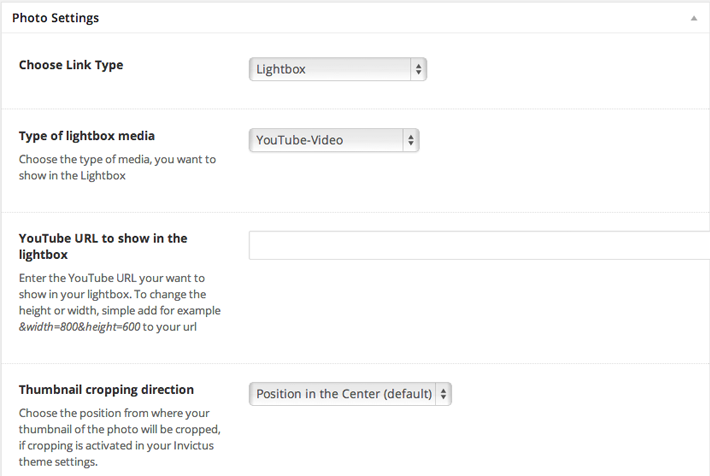 Your social icons will be displayed in the footer section. Please note: Only icons with a link will be displayed! If the link is not set, the icon is invisible! If you want to add your own custom social icons, you can use the Plugin "Social Bartender". This Plugin allows you to add new Social Icons to your theme. This Plugin will disable the display of the themes social icons. Invictus brings you a wide range of fonts to use in your Theme. All Google Font API Fonts are ready to choose. You can setup a main font style and a font style for your headlines. Go to Invictus Settings Menu, click on the "Fonts" tab. The Theme shows now your selected font on your page. You can add your own custom login logo for your WordPress admin section. This logo will be shown when you login to your WordPress admin above your login form. Create your own admin logo in PNG format with the dimensions 326x67px and save it as "wp-login-logo.png". You image will be shown as your custom login logo after reload. If the standard WP-Login logo is shown, please clear your cache. Invictus comes with some custom widgets for different uses - they can be found under Appearance > Widgets. This widget shows your latest Tweets on the Homepage or in any other widgetised area. Number of Tweets: The number of tweets to show in the fade effect on your homepage. This widget allows you to show your latest Photo Posts. Number of posts to show: The number of the latest photo posts to show in the widget. This widget shows Terms by Taxonomies. You can select the Taxonomy, change the sort order and the display type. This widget shows your latest Flickr Stream. 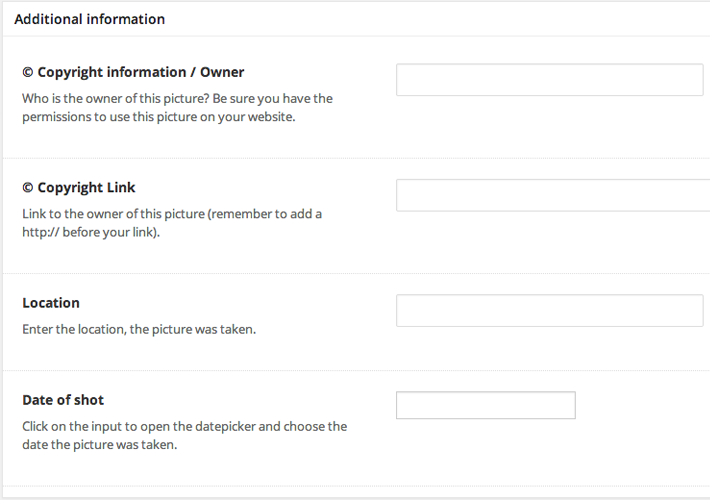 You can select the Number of Photos, change the sort order, change the type and add a custom Title. Number of Photos: The number of photos to show in the stream. Type: Choose if you want to show a User or a Group stream. Display: Order of the stream. This widget shows a Video for example from YouTube or Vimeo. You can add the embed code, a short description and a custom Title. Short Description: A short description for this Video. Most of the animation in this site is carried out from the customs scripts. In addition to the custom scripts, I implement a few "tried and true" plugins to create the effects. Most plugins are packed, so you won't need to manually edit anything in the files. You do not need to change any of this files or call them directly. 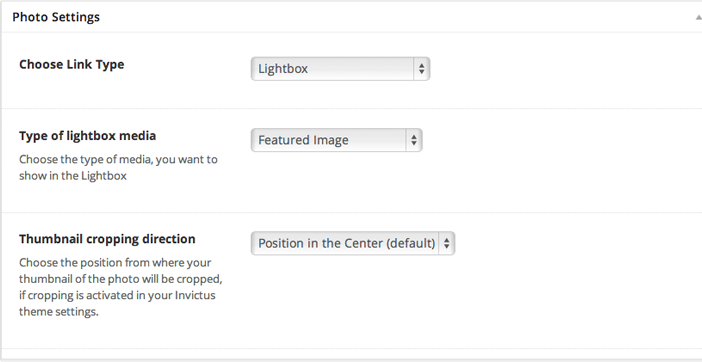 Needed changes can be made in the integrated Wordpress Invictus Settings Menu. Changing these files on your own risk. For detailed information to some of the scripts feel free to ask me via my user page contact form here. There are two full layered PSD Files in your downloaded zip archive. One PSD is for your Black Theme and one for your White Theme. No Images from the Preview are included in this PSD Files! I'm using different CSS files in this theme. Few of them are needed for some JS-Styles. So do not change them whitout knowing what to do. There are also some CSS files to fix IE bugs. The most important one is main layout CSS file with all major styles, like positioning, width and alignments. It is called style.css and is located in the main theme folder. Any major changes of layout should be done here. Color changes for your Black or White Theme can be made in your-theme-directory/css/black.css and your-theme-directory/css/white.css. Alle Images used in the Online-Preview are not included in this Theme or the PSD Files! Cheers, Dennis Osterkamp aka "doitmax"
Query galleries for "more from this gallery"
– Bulk Photo Posting - See it in action! "More Images From this Gallery"
Thank you for purchasing my theme. If you have any questions that are beyond the scope of this help file, please feel free to head over to our support board, verify your purchase and create a new topic over there. Visit Support Board. Thank you so much!